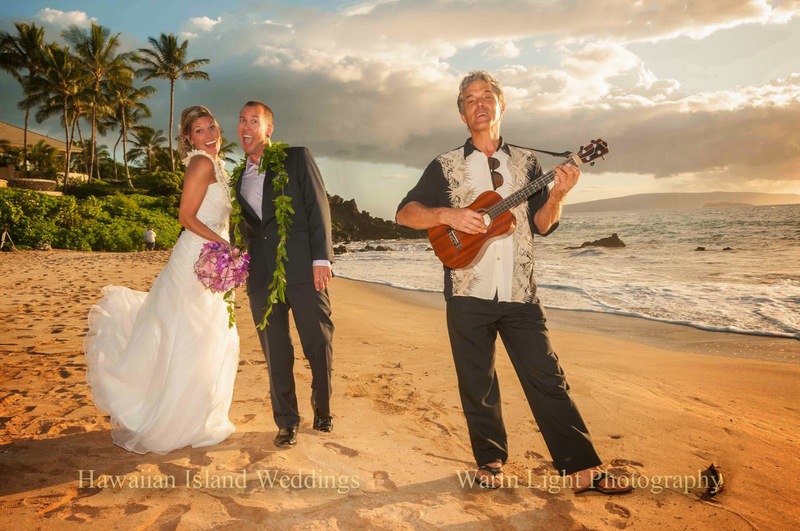 Jamie & Joseph, from Englewood, Colorado, decided that Maui would be the spot for their wedding & honeymoon. 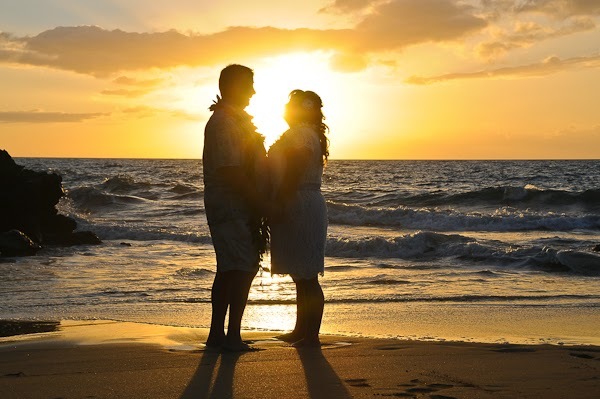 They were joined with their families and closest friends, and found out quickly that you don't have to twist arms to get people to come to Maui to see your wedding. Over 20 of them made it! 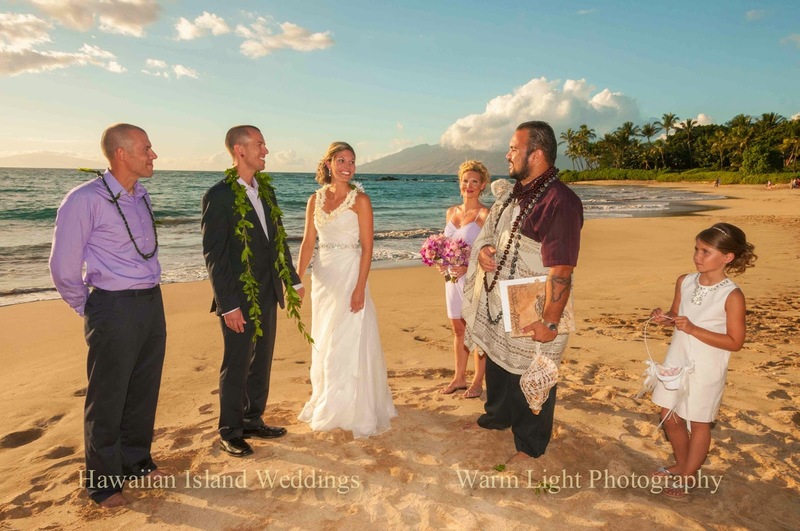 They were married by seasoned Hawaiian minister Rev. 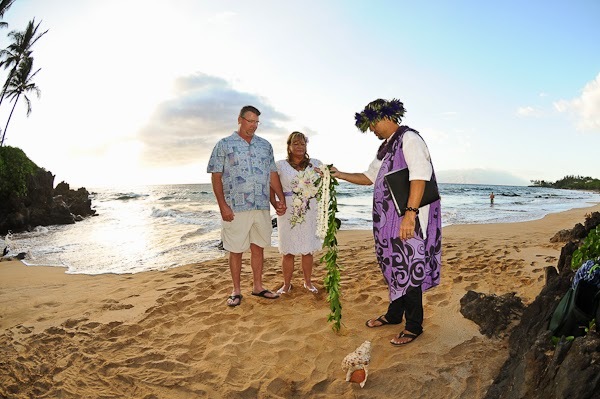 Kamuela Rodrigues with his non-religious Hawaiian style ceremony. Music was provided by Tim O'Hara and photos were created by the famed photographer Bruce Forrester, who is best known to have photographed the weddings of Nancy Pelosi's two daughters. 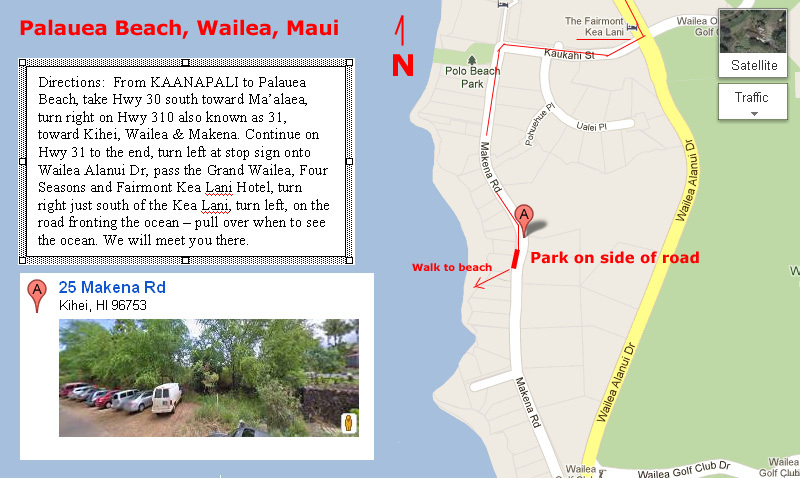 After Jamie had our very experienced and friendly hair & makeup artist Andrea Duarte styling her at her hotel, They showed up to Palauea Beach, aka. White Rock, and were met by Coordinator Tim Clark and Photographer Bruce Forrester. 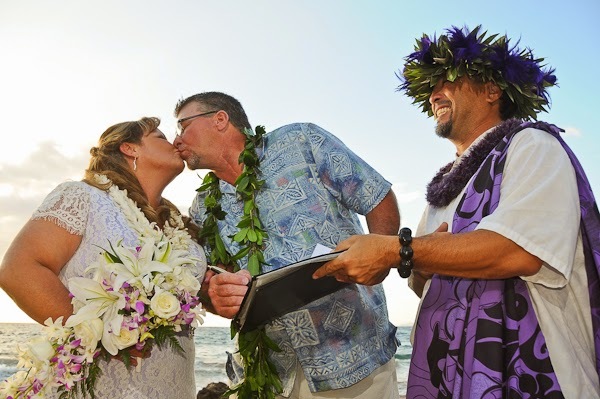 Their ceremony lasted 15 minutes and afterwards they signed their marriage license and posed for family photos. 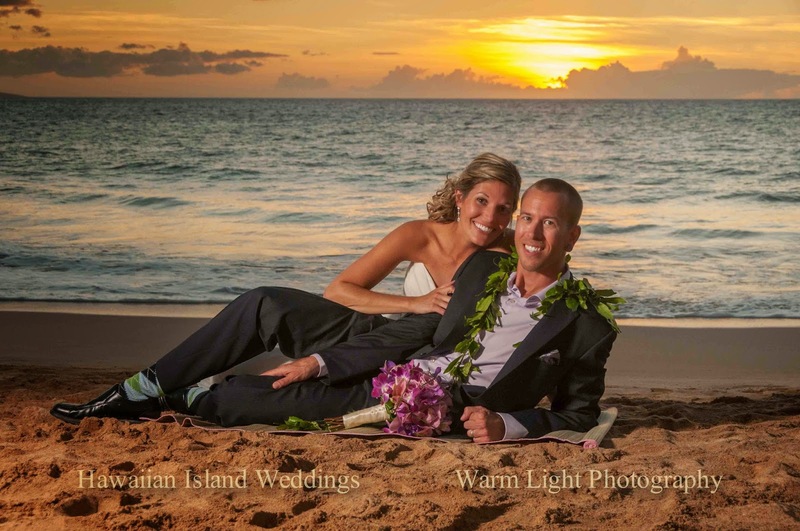 Back in Illinois, Angela & Michael didn't know exactly how to start planning a wedding in Maui, all they knew is that they wanted to tie the knot on a beautiful beach in Maui at sunset. They contacted their travel agent, Jennifer at Quincy's Discount Travel, and she told them about Hawaiian Island Weddings. 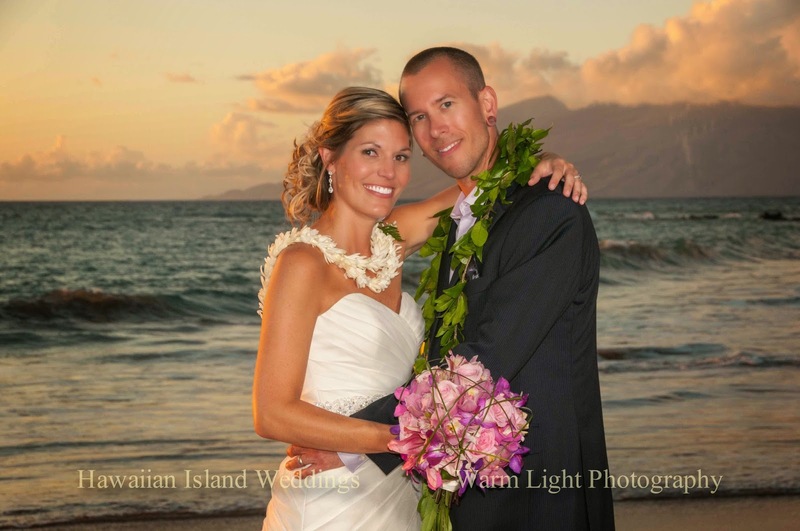 Angela & Michael didn't have any quests and stayed at the new Honokai Resort in Ka'anapali, as per Jennifer's recommendations. Angelia had Kymberly Marr and her assistant come right to her room to do her hair & makeup services. 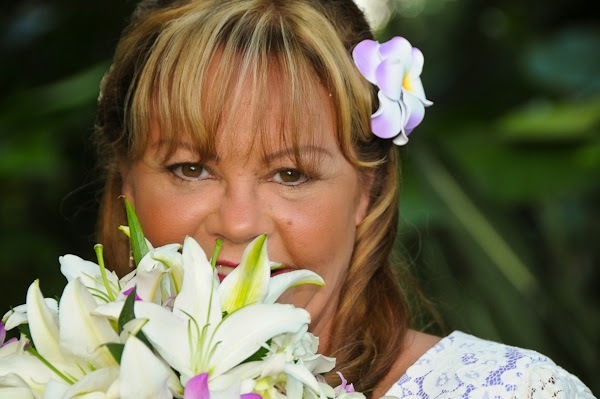 Kymberly is an expert at make-up with over 8 years of experience. 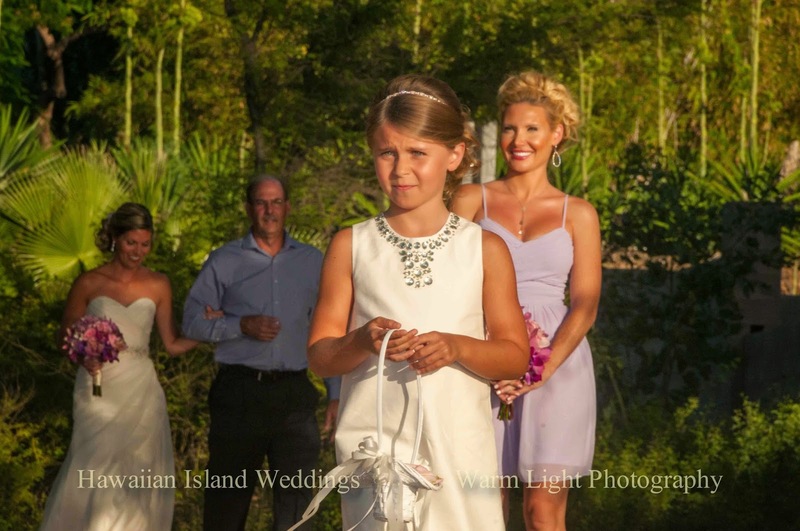 Their wedding was amazing! Rev. 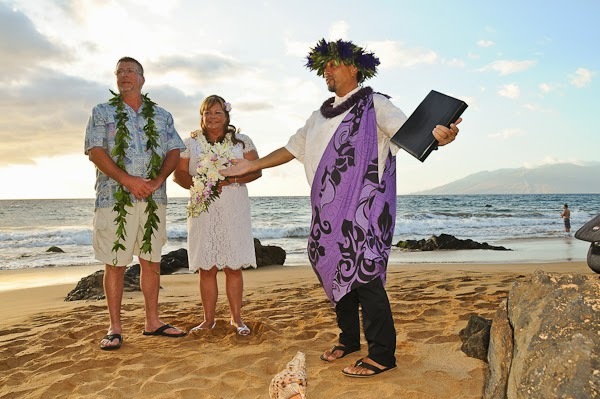 James Kimo Kirkman's easy-going attitude and non-religious ceremony was perfect for the two of them. 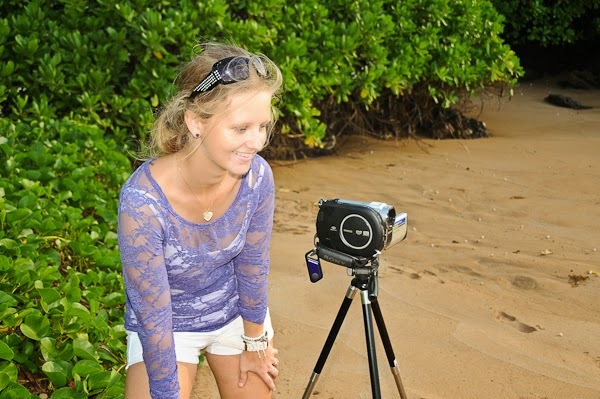 Senior photographer Tim Clark took some amazing photos and wedding assistant Elizabeth Clark helped by operating the couple's video camera. Afterwards, they returned to their hotel for an intimate dinner at the new Duke's Restaurant.